If your new home isn�t ready for occupancy, your household goods may need to be stored until you are ready to receive them. 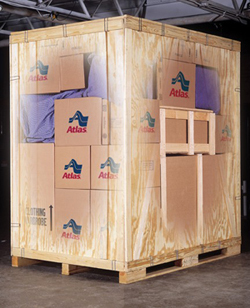 When your shipment is delivered to our warehouse for Storage-In-Transit (SIT), your goods are placed in secure storage containers to protect your items from loss or damage. Household items stay packed in their original moving cartons. Upholstered furniture is stored on specially designed racks and protected from dust and dirt with stretch wrap and plastic covers. We know quality storage is important to you. Our facilities are DOD and GSA approved and meet all of Atlas Van Lines �World Class Commitment� standards.